Java Junction. So accessible, yet so elusive. As seniors, we’ve had plenty of Java Junction experience. We know to steer clear of the pumpkin roll but to stock up on asiago bagels, and we survived the “Christmas in a Cup” epidemic of 2013. With all our years of experience, we had neglected to taste some of Java’s most revered concoctions. So, we set to rectify this wrong. 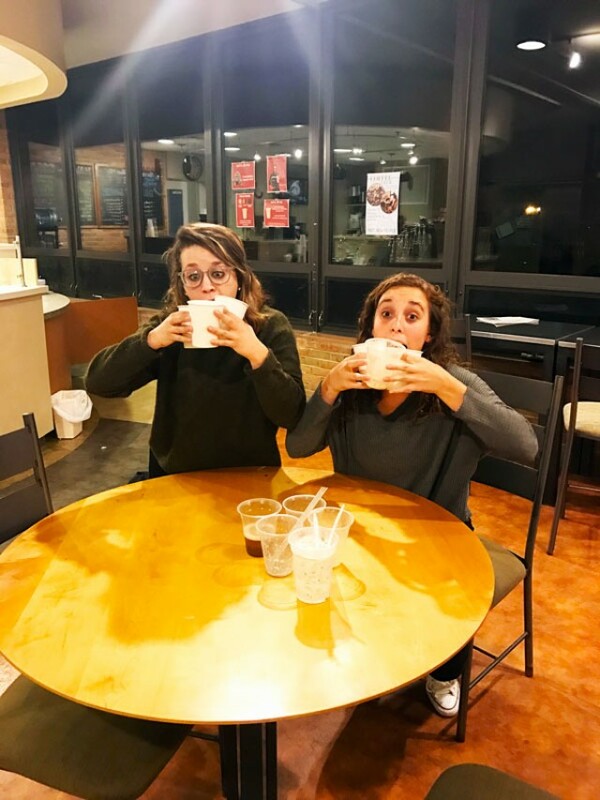 With the help of the wonderful Courtney Featherstone (barista extraordinaire), we were able to taste test 10 of the Java fan favorites and rate them on a scale of 1 to 5 (with 5 being the highest). We even turned it into a Record article so you could experience it with us!!!! Maddie (MB): This is Maddie and Maggie, coming to you live from Java Junction. We were just offered the excess of the drink of the week, and we are happy to report that there is NOT too much banana. But, there is definitely a lot of peanuts, so if you have a peanut allergy, avoid it at all costs. Maggie (MW): I think the best part is that you can’t even taste the banana. MB: Who needs fruit in your life, ya know? MW: Oh no, now I got it. That changed the whole drink. The further you get in, the more you get banana. I give it a 4. MB: Okay, we’re doing a sniff test. MW: Smells like mint, and oreos. Mint oreos. MB: Wait, I seem to be getting some aftertones… Aftertones? Is that what it’s called? Whatever. Okay, okay, that’s very good. MW: Yeah, I’m digging this. It’s better with the straw. Java has some dope straws. I have like over 200 in our house. No, more like 400 right now. MB: You gotta be careful, the oreo sticks to your teeth though. I’d give it a 5 for sure. MW: Yeah, I’m into this. I think it’s a 3 though. It’s pretty much just oreos and ice cream blended together. MB: Okay. The strawberry smoothie sans whipped cream– I know that changes the taste. Anyway, I rate this a 1. No, a 2. It’s definitely a fruit concentrate. MB: It’s a little watery. So, I would say…Yeah, like a 2. It’s not terrible, but if you’re a smoothie snob, you should find a different smoothie place. MW: Honestly, just buy a blender. You’ll save money. You don’t have to be restricted by flavors. Aldi has cheap frozen fruit #aldisaveslives. MB: Alright, we’re here with the first hot drink of the night, a classic Mocha. Wow. That is some quality espresso, with just the right amount of chocolate. MW: Made by barista extraordinaire, Courtney Featherstone. MB: Yeah, shout out to Courtney Featherstone. Because she’s fantastic. MW: It could use a little more coffee for me though. If I just put a bunch of coffee into it, I’d be a happy girl. The espresso’s not burnt, which is really nice. I give it a 3. MB: Me too. I’d give it a 3. Would recommend. Courtney Featherstone (CF): No, no, The Bear is NOT healthy. MB: It doesn’t smell healthy either. MW: It’s good though. Oh, oh I’m into this. Oh that is a 5. Hands down a 5 for me. No, I’m giving it a 4– it has some ice chunks in it. MB: I’m going with a 4. There’s not enough espresso in it for me, but you can taste the hazelnut, caramel AND chocolate. MW: Oh man, this is dangerous. Thank God I don’t have Munch Money. MB: Definitely good. Shoutout to Claire Frederick who came up with this drink. MW: Sidenote, I have been petitioning to turn Java into a Chipotle for four years now. Tacos, not mochas. Barbacoa over baristas. MB: Extra guac over hot choc. MB: Okay, it’s time for a Spiced Chai. MW: That’s a 1 for me. It’s too much cinnamon. But I’m really picky of chai. It’s too sweet, that’s what it is. I think it’s because it’s the chai syrup, not the chai teabag. MW: Overall, go for the Apple Pie Chai, that’s my ish. Or just the regular chai. Pie is the worst of all desserts, but if you put it into chai, it’s fine. I don’t like you if you like pie. MB: It may not be a popular opinion, but pie is the worst. MB: Javacino! It’s a little… grainy. Too sweet for me. But you run your own risk when it has so many flavors in it. There is a limit to the amount of syrups you can have. There is such a thing as too much syrup. I give it a 2. MW: I think it’s too sweet. I give it a 1. MB: This is a personal favorite of both of ours. The espresso is the strongest of any drink thus far, I would say. There’s some undertones of hot chocolate in it too. I give it a…4. MW: The fact that there’s chocolate milk in this is great. I think though, as I’ve gotten older, and my palate has matured, I don’t like as sweet of things. But I give it a 5. It’s nostalgic and beautiful, and chocolate milk deserves a 5. MW: We’re going for the classic latte. MB: It’s a nice break from everything sugary we’ve been drinking. MW: Yeah, it’s your classic latte. I’m not a huge fan of lattes because they’re so milky, and I don’t like straight milk unless it’s chocolate milk. I’m into this. If you add a half shot of hazelnut and some soy milk, that’d be perf. That’s the secret to being me, right there. MB: Or you could be like Sketch house and have four different types of milk… I give it a 3. MW: Hm, I give it a 3. No, a 3.5. MB: We are now trying the Java Junk, which is more ice cream than anything. And it’s wonderful. MW: Oh my god. This is made for me. It’s like a Blizzard you can get on campus. I think I give it a 4. The cookie dough isn’t the best cookie dough I’ve ever had. But ice cream is everything. MB: I worked at Dairy Queen. I know what Blizzards are supposed to taste like. So, I give it a 4 too.